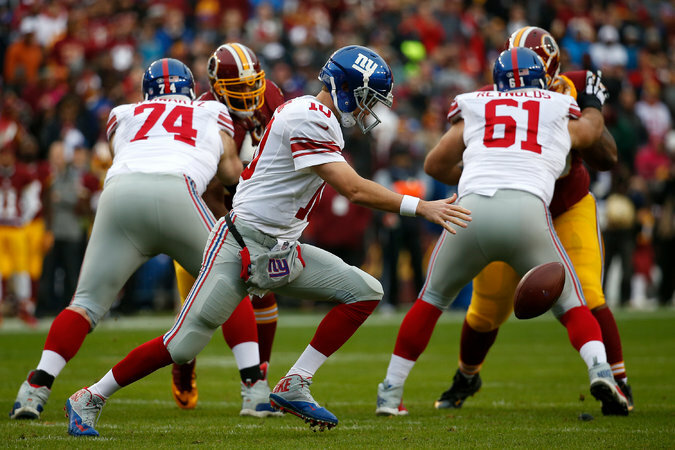 Eli Manning dropped the ball as guard Geoff Schwartz (74) blocked against the Redskins on Sunday. Schwartz broke his left leg in the game. The Redskins’ Ryan Kerrigan taking down Manning, who was sacked three times as the Giants had to use backups on their offensive line. For the banged-up Giants, Monday’s injury news was not uplifting. Guard Geoff Schwartz, who was considered a key acquisition during the 2014 off-season but missed 14 games because of foot and ankle problems last year, was lost for the rest of the season with a broken left leg sustained in Sunday’s loss to the Washington Redskins.